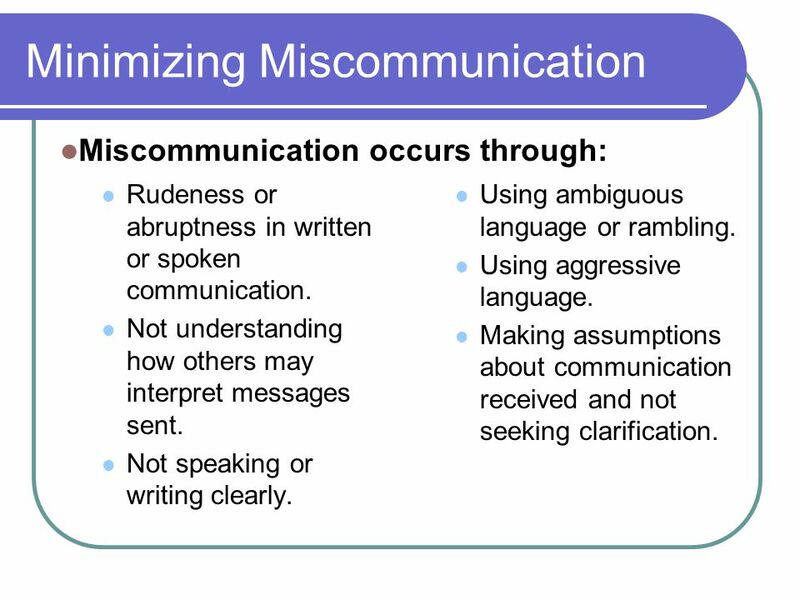 Miscommunication occurs through: Rudeness or abruptness in written or spoken communication. Not understanding how others may interpret messages sent. Not speaking or writing clearly. Using ambiguous language or rambling. Using aggressive language. Making assumptions about communication received and not seeking clarification. 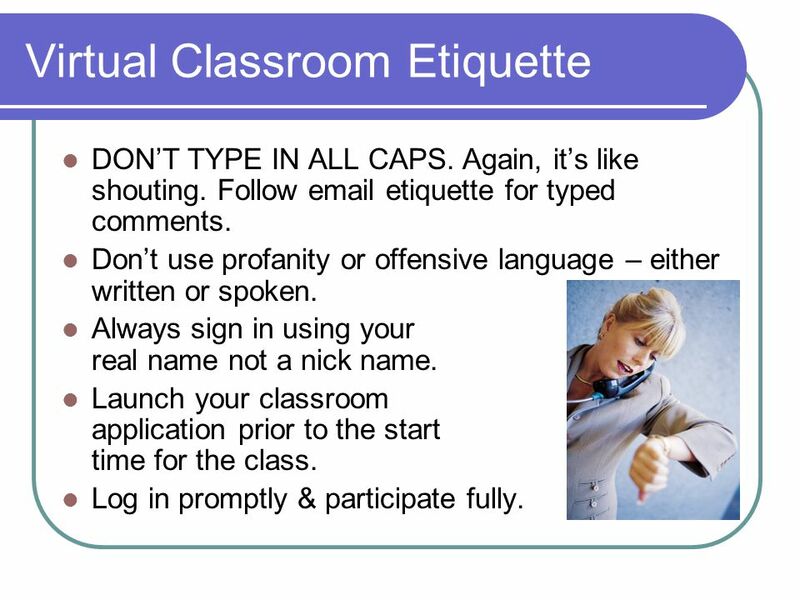 4 Email Etiquette Manners & Tone Please and thank you go a long way. 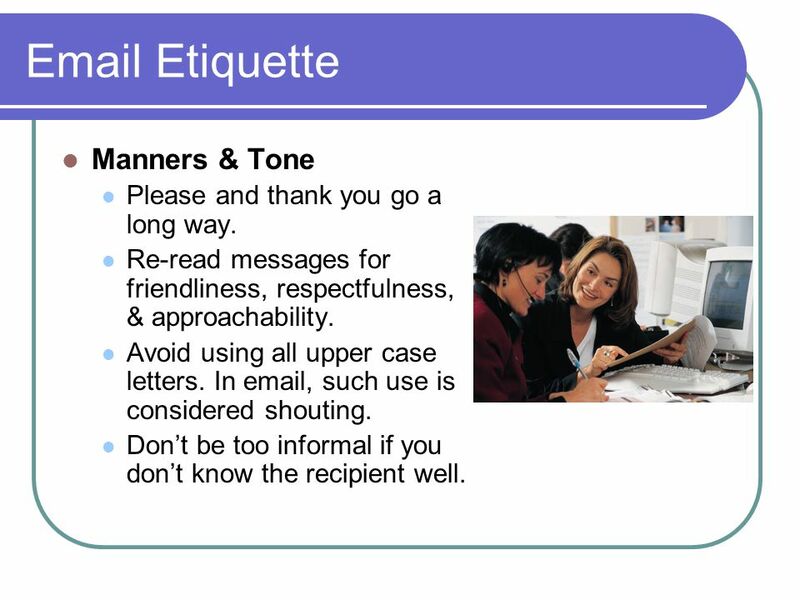 Re-read messages for friendliness, respectfulness, & approachability. Avoid using all upper case letters. In , such use is considered shouting. 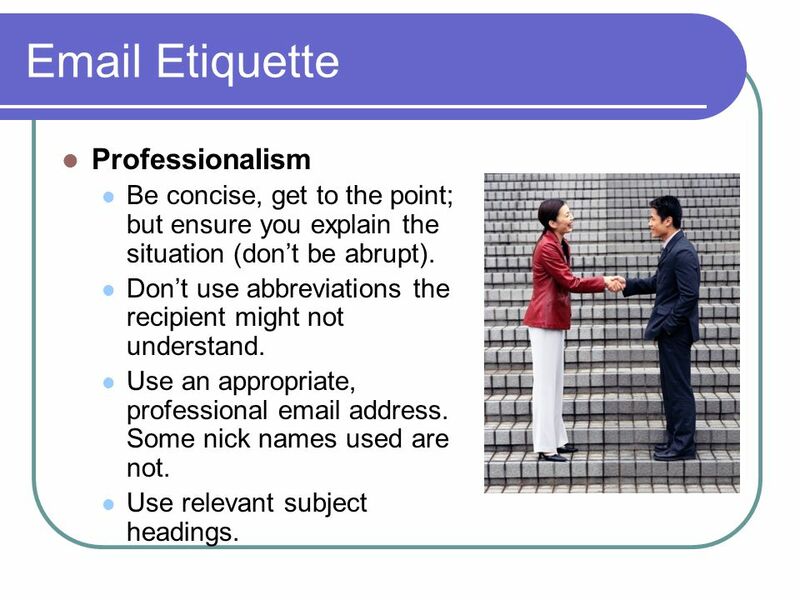 Don’t be too informal if you don’t know the recipient well. Be concise, get to the point; but ensure you explain the situation (don’t be abrupt). Don’t use abbreviations the recipient might not understand. Use an appropriate, professional address. Some nick names used are not. Use relevant subject headings. 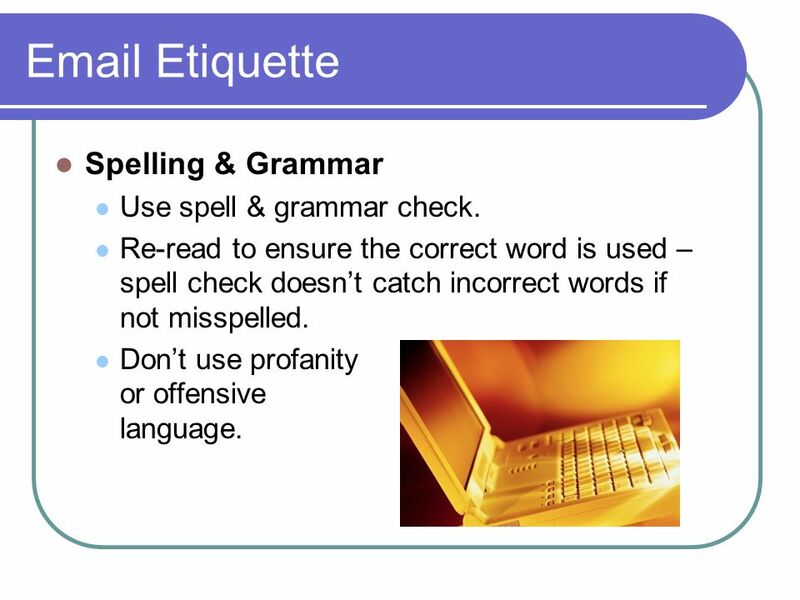 6 Email Etiquette Spelling & Grammar Use spell & grammar check. Re-read to ensure the correct word is used – spell check doesn’t catch incorrect words if not misspelled. Don’t use profanity or offensive language. Respect each other’s perspectives. Raise your “virtual hand’ and wait to be recognized. 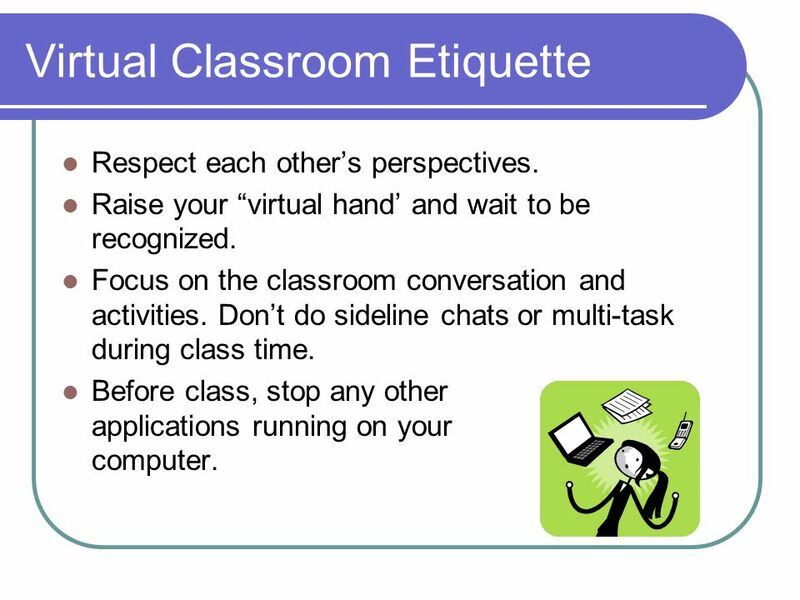 Focus on the classroom conversation and activities. Don’t do sideline chats or multi-task during class time. Before class, stop any other applications running on your computer. DON’T TYPE IN ALL CAPS. Again, it’s like shouting. Follow etiquette for typed comments. Don’t use profanity or offensive language – either written or spoken. Always sign in using your real name not a nick name. Launch your classroom application prior to the start time for the class. Log in promptly & participate fully. 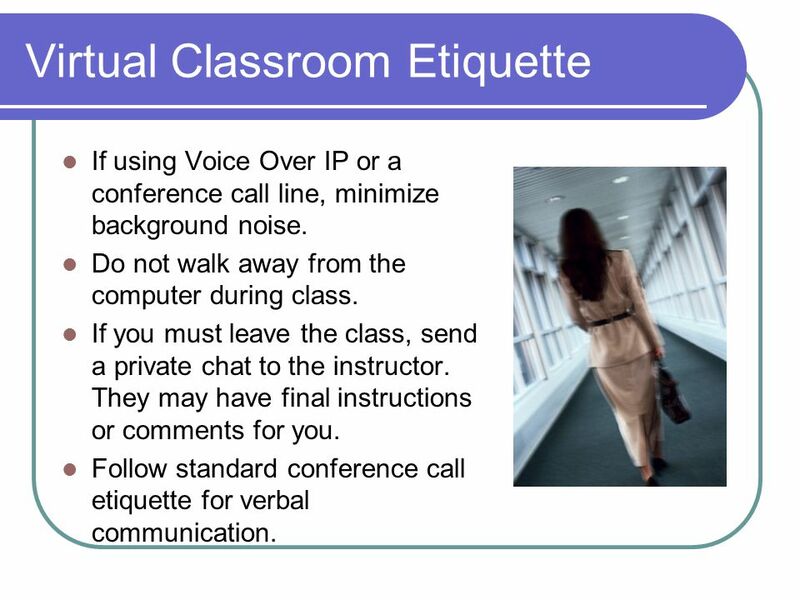 If using Voice Over IP or a conference call line, minimize background noise. Do not walk away from the computer during class. If you must leave the class, send a private chat to the instructor. They may have final instructions or comments for you. 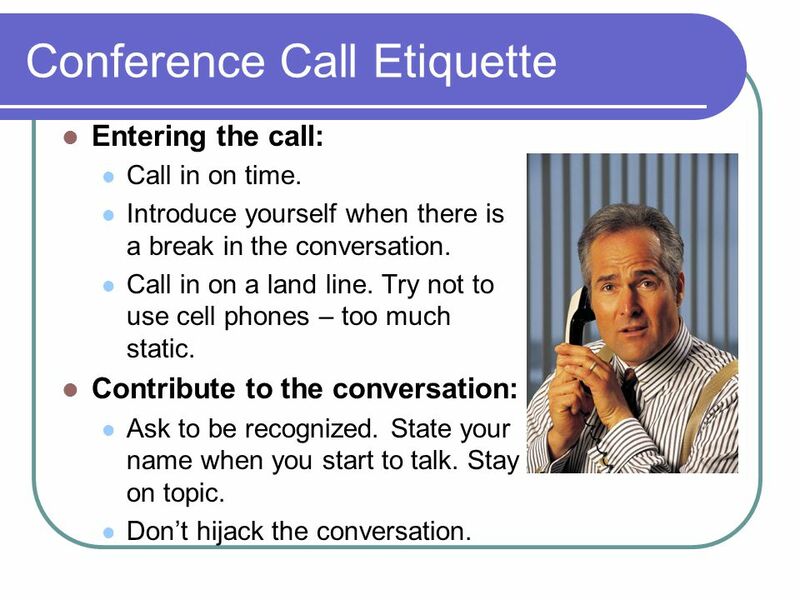 Follow standard conference call etiquette for verbal communication. Follow standard etiquette guidelines. Don’t interject comments until you know what the conversation is about. In a synchronous chat room, don’t type in long detailed messages that take a long time or a lot of space. When making comments about political, social, or moral issues or values, start comments with “I feel”, “I believe”, or such. Do not attack others because of their perspective. 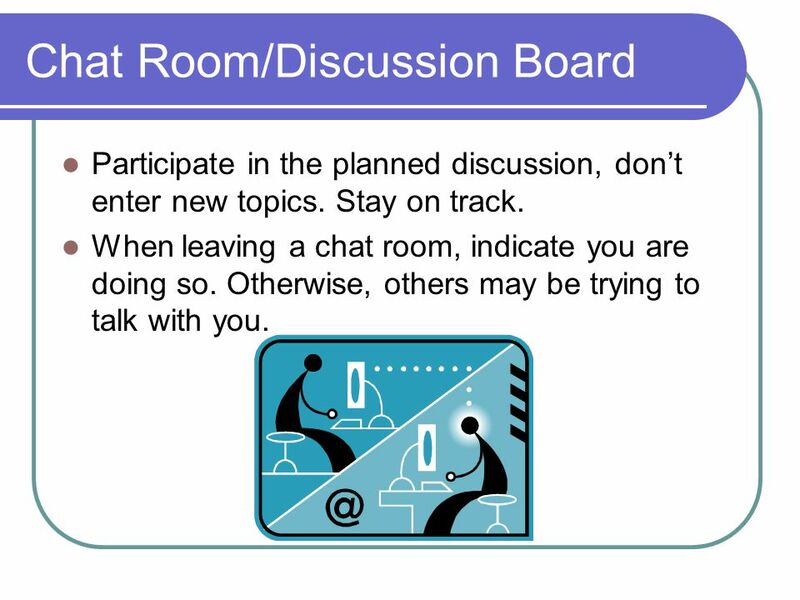 Participate in the planned discussion, don’t enter new topics. Stay on track. When leaving a chat room, indicate you are doing so. Otherwise, others may be trying to talk with you. 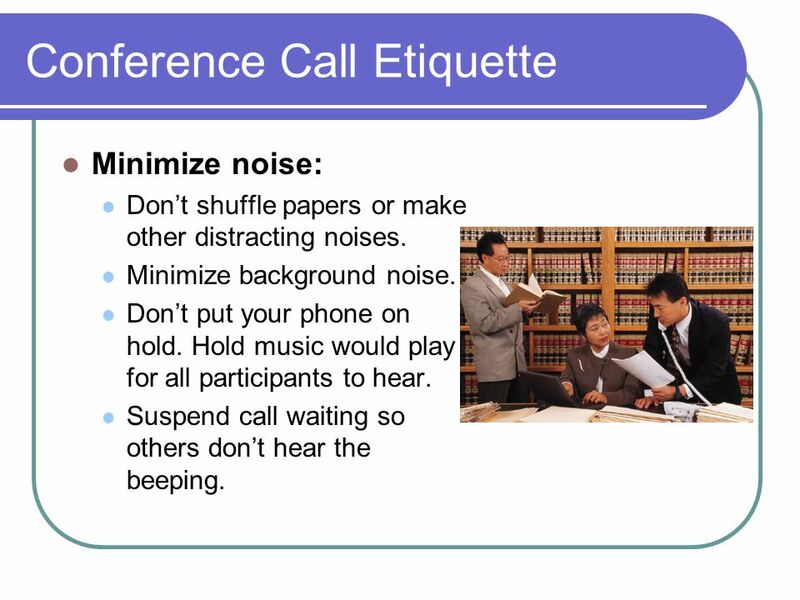 Minimize noise: Don’t shuffle papers or make other distracting noises. Minimize background noise. Don’t put your phone on hold. Hold music would play for all participants to hear. Suspend call waiting so others don’t hear the beeping. Entering the call: Call in on time. Introduce yourself when there is a break in the conversation. Call in on a land line. Try not to use cell phones – too much static. Contribute to the conversation: Ask to be recognized. State your name when you start to talk. Stay on topic. Don’t hijack the conversation. 14 Conclusions Practice patience, tolerance, and tact just as you would in a face-to-face communication mode. 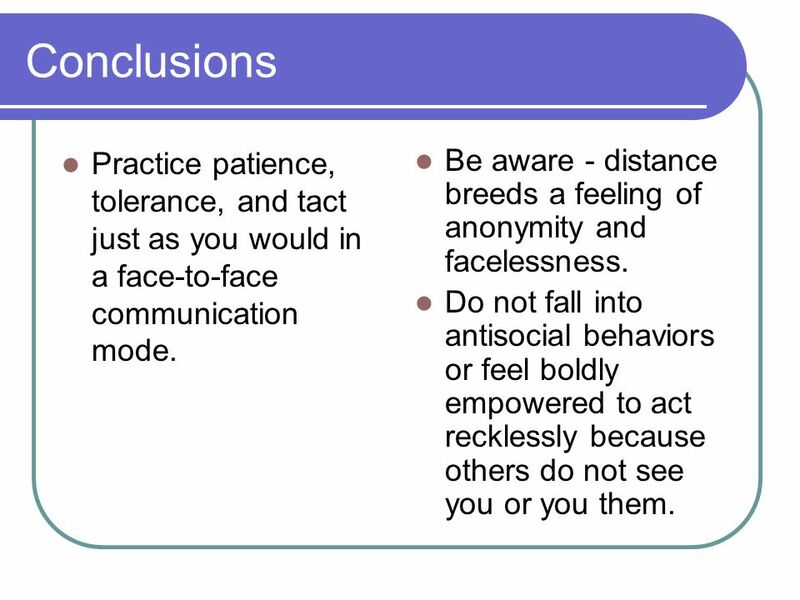 Be aware - distance breeds a feeling of anonymity and facelessness. Do not fall into antisocial behaviors or feel boldly empowered to act recklessly because others do not see you or you them. Download ppt "Communicating in a Virtual Environment"
Communications Survival Guide Developing Leadership Presence Through Effective Communication Developed by: Robbie Bailey Human Resources Manager John Deere. Classroom Management 07 September There is no one right or wrong method for classroom management. Its a myth that One size fits all; it just doesnt. The basics that we should all remember while communicating digitally. Description of the Project The Consumer Operated Service Program (COSP) will study the impact of participating in a consumer-operated service by examining. Internet etiquette, or netiquette guides us in proper behavior on the Internet. 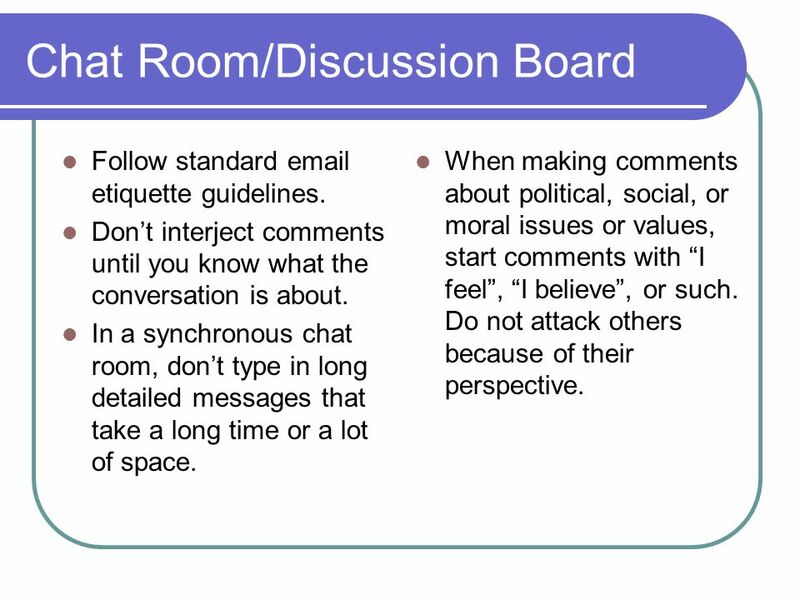 There are widely accepted rules of behavior to follow when you're online. Communicate and Work Effectively in Health. Communication What is communication? What is communication? Communication is the process of transferring information. 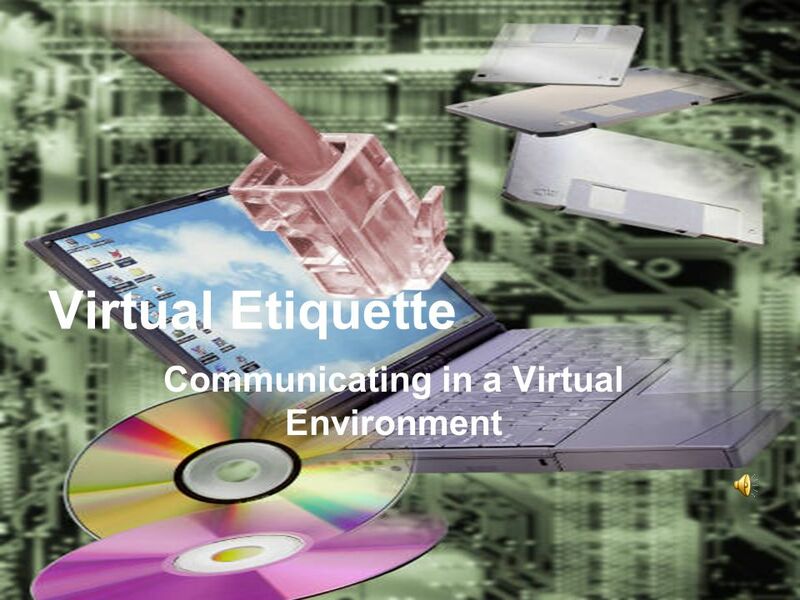 ETIQUETTE What you need to know about communicating effectively in an electronic medium. 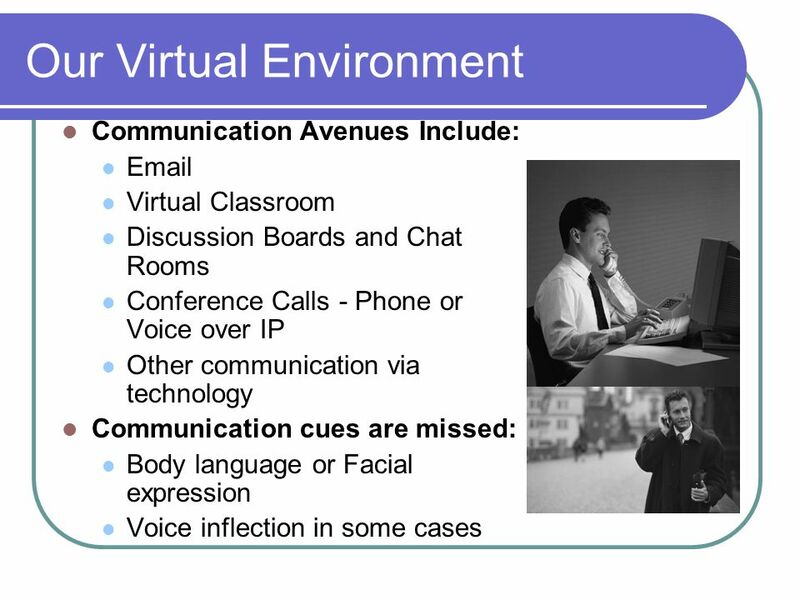 Soft Skills for a Digital Workplace: Verbal Communication Unit C: Developing Professional Telephone Skills. Registered Students: 1. Sign in, pick up a syllabus On the wait list to add? 1. Sign in 2. Add your name and address to the wait list 3. Please. Registered Students: 1. Sign in, pick up a syllabus On the wait list to add? 1. Sign in 2. Add your name and e-mail address to the wait list 3. Please.